Oh, how I adore soup weather. I could seriously eat soup every day when it's chilly outside. There are so many types and flavors. It surprises me that this is the first soup recipe I've posted; new ones are being created in this kitchen all the time. If you like a soup that's healthy, flavorful, and comforting, you've come to the right place. This warming dish is crafted with probiotic-rich creme fraiche, immune-boosting chicken stock and garlic, and sniffle-fighting cayenne pepper. But for those of you who don't enjoy spicy soups; fear not. My son is spice-sensitive and he loves this soup. Add potatoes and stock. Bring to a boil and skim off any foam. Reduce heat to a simmer and add cayenne pepper and thyme. Simmer for about 15-20 minutes. Remove from heat and add garlic, creme, cheese, salt, and pepper and puree soup with a hand-held blender until desired smoothness. Fill serving bowls with soup and garnish (optional) with chives and bacon pieces. I love soups too! Cant wait to try this one out! This sounds and looks delicious, I have LOTS of potatoes just waiting for a recipe like this. Sounds yummy! Might have to try it, see if my kids will eat it. lol. YUM! I love soup, and this one looks and sounds SO GOOD. I'm bookmarking it! This sounds like such a comforting bowl of goodness! What a delicious recipe - thank you for sharing it. Great looking soup. Love the colors. I make a similar soup every few months in large amounts and then freeze it in batches. For a little lower calorie version (but lacking the probiotic-rich cream fraiche) I go with fresh squeezed lemon juice to get the acidic punch. Usually a little Tabasco too. Sometimes I'll throw some scallops or white fish in there to mix it up. I already had potato soup planned for tonight to use up a bit of leftover mashed potatoes - Perfect timing! I've been using soups a lot lately to stretch the budget. I saw you on RFW. I adore soup season for so many reasons. I love potato cheddar soup (just made one last week) and think this recipe sounds fantastic with all of the amazing flavors! The color of your soup is so eye catching. Potato cheddar soup is always a good idea. 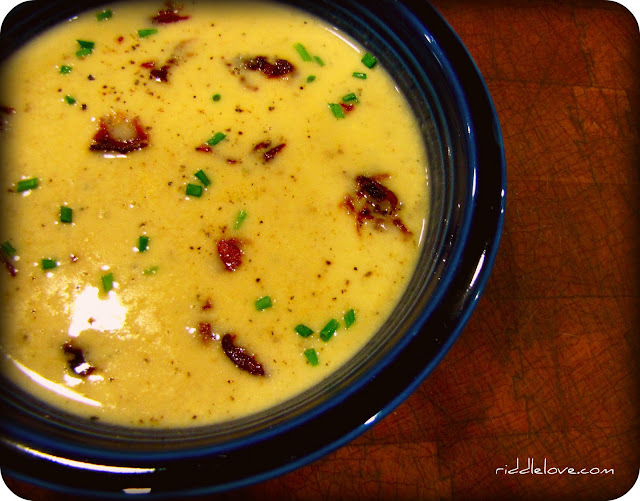 Great looking soup, everyone needs another potato soup recipe, you can not go wrong with soup. This recipe sounds great. Perfect for a cold night!! It is raining here today so your soup looks wonderful! Great photo...I will have to try your recipe. Thank you for sharing it with us. This sounds like such a cozy soup, I might have to make it this week. This looks so so yummy!! I am going to have to try. There is just something about soups - I could eat it almost year round. I love potato soups of all kinds - yours sounds delicious - I love the cayenne pepper - I have never done that! Thanks for sharing this with the hearth and soul hop! that soup looks soooooo goooooood. So much cheese. I think I'd regret it. i bet this is delicious...with all those yummy flavors...if i weren't stuffing myself silly in barcelona right now, i would say you were making me jealous with this! :) i am definitely going to try this when i get home...thank you for sharing with tuesday night supper club! I found the recipe at Sustainable Eats on Simple Lives Thursday and made it last night. . fabulous! So easy and so good! Even my non-soup eater was taken in by the cheese he saw me grate into it and the bacon pieces I snipped as a relish on the top. I used plain yoghurt in stead of the creme fraiche and it came out fine. . my 15yo dd called it "mashed potato soup" and mp are her favorite! Thanks for all the wonderful feedback! Hearing from you who try out the recipes is really helpful. Love! Great recipe. Can't wait to try it out at our mommy brunches. It's been really chilly here in Antigua lately, we could use a good heartwarming soup. Love it, thanks for linking to Fat Camp Fridays! I am in agreement with Amanda! The best! The first time I made it I was doubting adding the garlic at the end since I am so used to adding it in the beginning, but it is not nearly as good that way! Is that a secret culinary secret I don't know about and/or do you just like to consume it raw? It is so yummy and adds the perfect bite at the end of the cheesy potato flavor. Okay I could go on more about it but I will stop here- SO GOOD, thanks again! Hi! I came over from your recent freezer meals post linked to Pennywise platter. I love that this soup does not contain milk, because by DH and baby are sensitive to milk, but yogurt and cheese don't seem to bother them much. I am going to try this - I miss cream soups! wow Katie, I made this soup today and wow girl, it's amazing! my mainly thinks I'm the queen bee right now (which I am)! many blessings, joy, peace and love to you and yours this year! I guess I've never commented here before now. I just want to say I've been making this soup since you first posted it. It's our favorite soup and gets rave reviews every time. I love your recipe- thank you so much sharing it! You Say "Pumpkin," I Say "Kabocha"